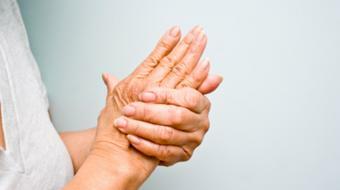 John Wade, MD, FRCPC, discusses rheumatoid arthritis treatment options. Rheumatoid Arthritis Treatment John Wade, MD, FRCPC, discusses rheumatoid arthritis treatment options. So there are a number of medications used for rheumatoid arthritis. Often, the first class of medications that one will use early on are non-steroidal anti-inflammatories, commonly known as “NSAIDs.” And the NSAIDs are familiar to all of us – the colored ones are Aspirin and Ibuprofen, but there are a whole number of other ones, a list of 10 or 20 that you may be familiar with. And these medications are commonly taken on a daily basis, and they will often treat the first symptoms of rheumatoid disease quite effectively. So it’s important for individuals to recognize that medications have side effects. Those side effects can be severe, and so one needs to realize that if they’re gonna start a medication, they need to discuss with their doctor and their pharmacist whether that medication is right for them.